2019 Minneapolis Supercross Results: Although he took a week off for the mud in San Diego, it seems as if Red Bull KTM’s Cooper Webb is taking a stranglehold on the 2019 Monster Energy/AMA Supercross Series. 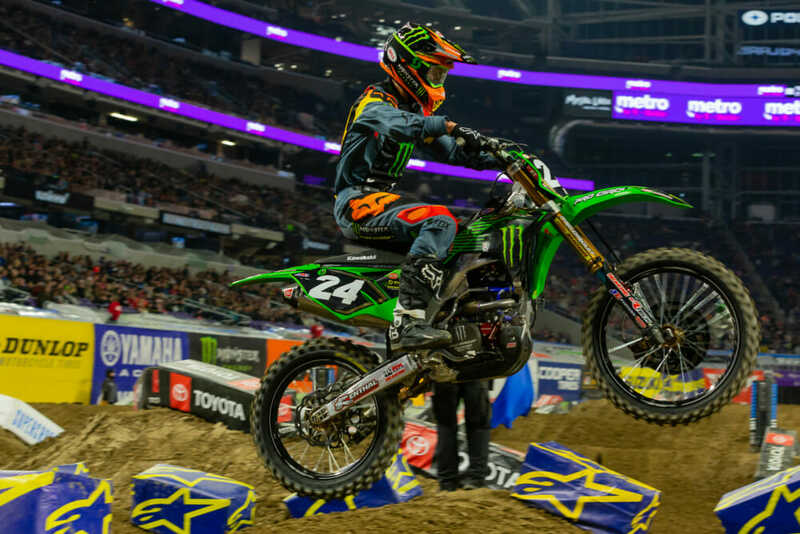 Webb became the first (and is still the only) repeat winner of 2019 after winning Anaheim 2 (round 3) and Oakland (round 4), but made a couple of mistakes in the mud of San Diego last weekend and gave way to Monster Energy Kawasaki’s Eli Tomac, who took the win and took over the points lead. But Webb put himself right back up on top in Minneapolis. Webb started the night by grabbing the holeshot in his heat race just in front of points leader Tomac, then held Tomac in place for the entire race, eventually taking the win and the number-one qualifying spot. In the main event, Webb grabbed another holeshot but was quickly passed by Tomac’s teammate Joey Savatgy. Savatgy led a freight train of racers for more than half of the main event while Webb ran second just behind him, and Honda’s Ken Roczen and Rocky Mountain ATV/MC KTM’s Blake Baggett stayed close. 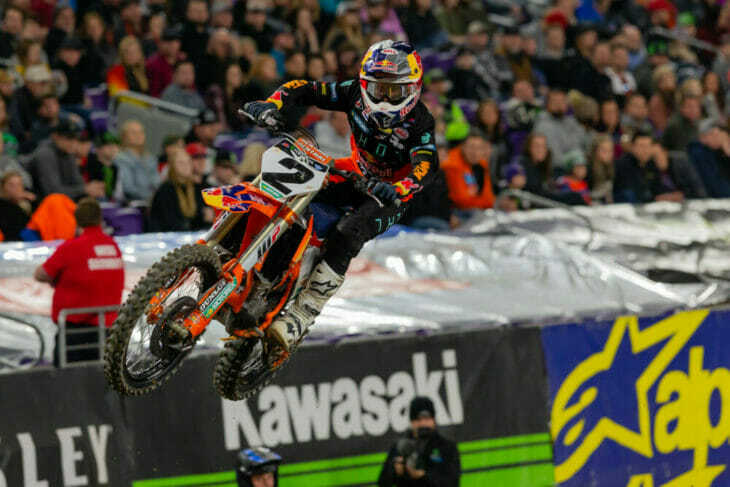 The four were eventually joined by Webb’s teammate Marvin Musquin, but were never joined by Tomac, who started outside the top 15 in his first race with the red plate and finished sixth. Webb pressured Savatgy until finally forcing a mistake and taking over the lead, then Webb sprinted for a couple laps while Savatgy had his hands full with Roczen, Baggett and Musquin. All three eventually found their way by Savatgy, but Baggett went over the bars a few laps from the end and vacated third place. Baggett quickly walked off the track but we don’t yet have an update on his condition. 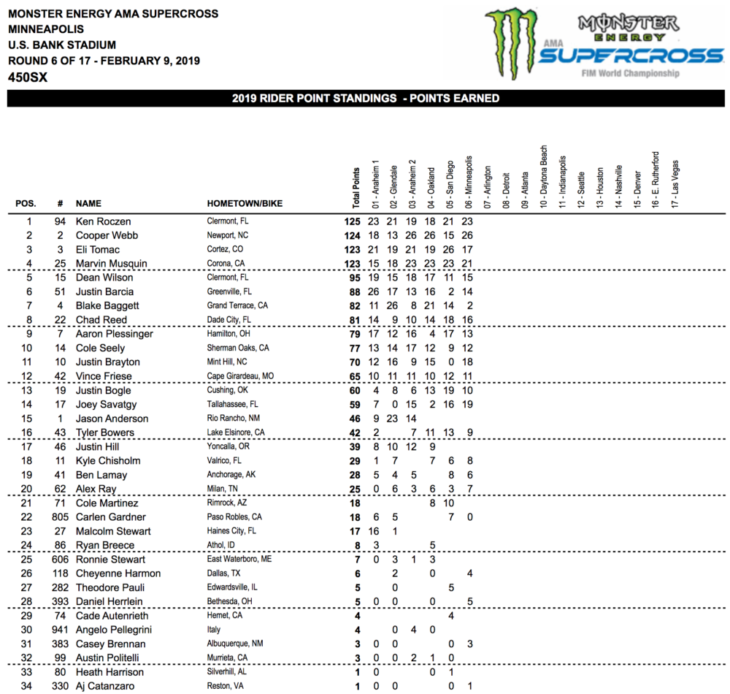 Webb went on to win his third main event of the year and move back into second in the points chase, one point behind Roczen, who leads the points yet again despite not yet winning a single race. 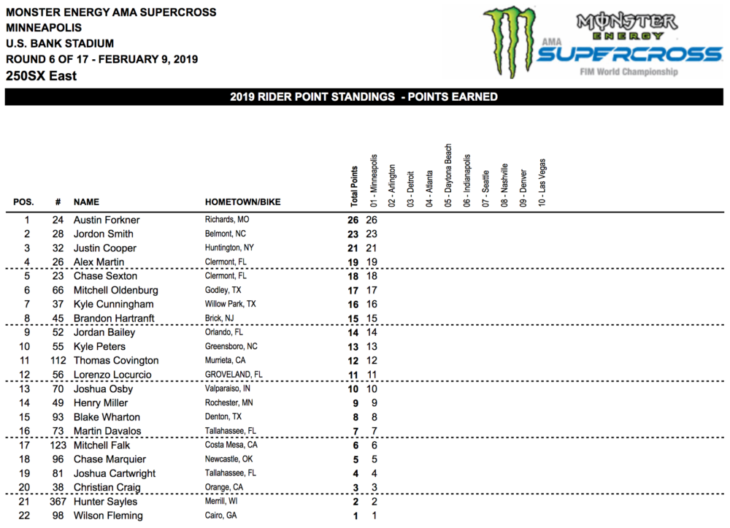 Musquin and Tomac are tied for third and fourth in points, just one point behind Webb and two behind Roczen as the series heads to Arlington, Texas, a week from tonight. Minneapolis marked the first round of the 250cc Eastern Regional Supercross Series, and Monster Energy/Pro Circuit Kawasaki’s Austin Forkner led every lap of his heat race and every lap of the main event after grabbing the holeshot in both races. 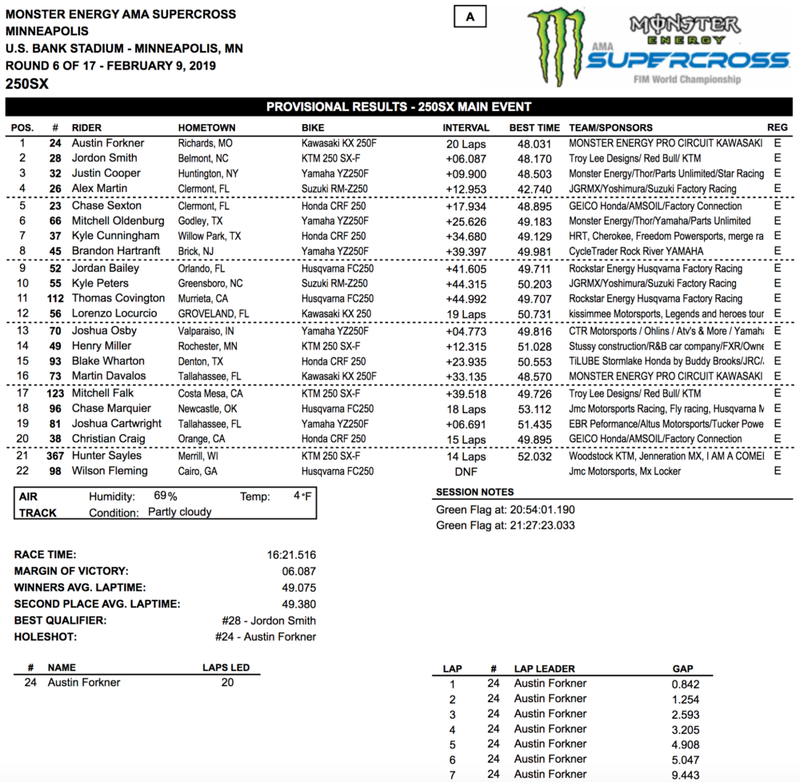 Forkner dominated the main event over TLD/Red Bull KTM’s Jordon Smith, whose team had to replace his rear wheel on the start line after he suffered a flat tire during the parade lap. Monster Energy/Yamalube/Star Racing Yamaha’s Justin Cooper rode solid all night on his way to third in the main event, his first-ever supercross podium finish. 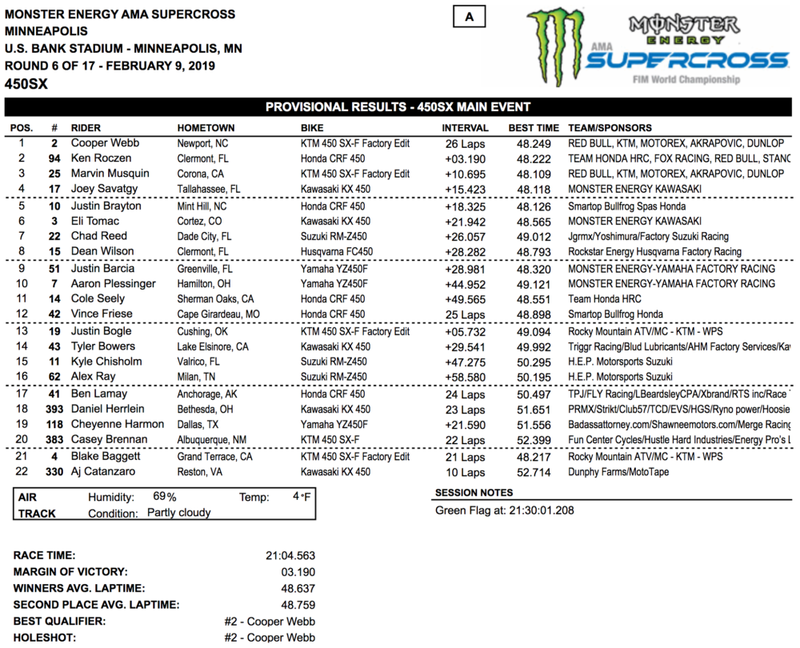 Cooper had to find a way past JGR/Yoshimura/Suzuki Factor Racing’s Alex Martin late in the main event for the spot. 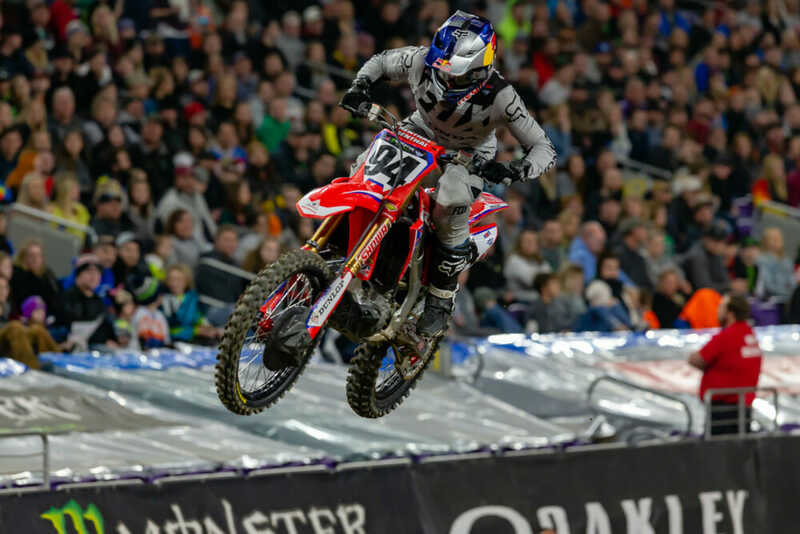 Martin finished fourth, just in front of GEICO Honda’s Chase Sexton who fell about halfway through the main event while pressuring Martin.